ASTM B111 specification establishes the requirements for seamless tube and ferrule stock of copper and various copper alloys of a specified range of diameters, for use in surface condensers, evaporators, and heat exchangers. The specified coppers and copper alloys are UNS No. C10100, C10200, C10300, C10800, C12000, C12200, C14200, C19200, C23000, C28000, C44300, C44400, C44500, C60800, C61300, C61400, C68700, C70400, C70600, C70620, C71000, C71500, C71520, C71640, and C72200. 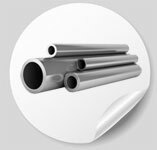 The product shall be produced by processes such as casting, extrusion, drawing, annealing, straightening, trimming, and other processes which may produce a seamless tube in the specified condition. The coppers and copper alloys shall be specifically furnished in any one of the following tempers: annealed, light-drawn, hard-drawn, or hard drawn and end annealed. Tubes for ferrule stock shall be annealed sufficiently to be fully crystallized. Some tubes are suggested to be subjected to a stress-relieving thermal treatment subsequent to straightening. The products shall be subjected to expansion, flattening, and residual stress tests. The tensile and expansion requirements for the products are specified in accordance with the temper designation. The products shall also be subjected to mercurous nitrate, ammonia vapor, Eddy-current, hydrostatic, and pneumatic tests. B111 / B111M C61300 .